Physical activity reduces stress and tension, making you a relaxed person. You have more energy and feel less tired. Exercise can increase your skills. 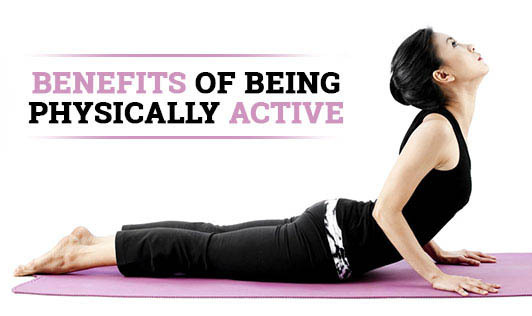 Physical activity releases endorphins - these are the body's natural "feel good" chemicals. Your muscles become stronger with more physical activity. You have a better sleep when you are regularly active. You can use strenuous physical activity as a way of reducing your anger. Physical activity means a strong heart and lungs - they'll last longer. Exercise can also be a way of socializing - making new friends, enjoying the fun of a social team game together, or chatting while you walk, play tennis or bike ride together. substance use, unhealthy diet and violence). Being physically active involves moving your body and using energy (expressed in kilocalories, Kcals) at an intensity that makes you warm and breathe a bit deeper than usual (such as brisk walking). Anyone can do this and achieve a healthier lifestyle!